For about 10,000 years, Hueco Tanks in East El Paso has been a destination for people of all types. The rock formation brings nature enthusiasts from all over the world to practice rock climbing, bird watching, camping and to know about its unique history. But, despite its worldwide fame, many El Pasoans do not know about the picturesque rock formation in their own backyard. 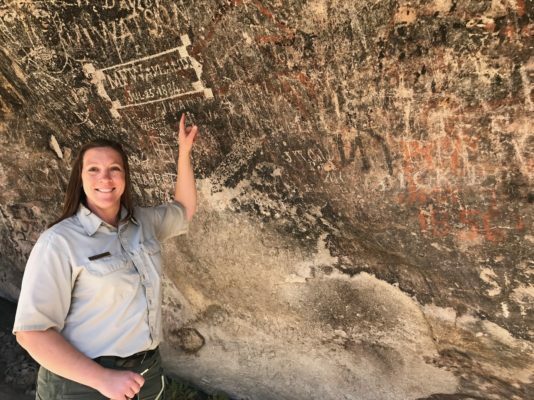 “Not a lot of people know we are out here,” said Kendra Moore, park ranger and interpreter at Hueco Tanks State Park and Historic Site. Moore provides interpretation tours of pictographs and background information on how the rock formation was home in the past to Native Americans and later to white settlers. From 1858 to 1859, Hueco was used as the Butterfield Overland Mail stage line. Many travelers and soldiers stopped to rest and write their names over the Native American pictographs. On one of the rocks, there is a drawing of a tribesman and she speculates it was drawn by one of the settlers because Native Americans never actually painted any forms of themselves. “It reflects the time period when settlers had different views on Native Americans. The pictograms weren’t really respected,” said Moore. The names of travelers that are written over American Indian pictographs are not allowed to be removed, since the names tell the history of people who visited the park at the time. “Since a lot of them are 60 years old or over, we can’t actually remove the graffiti because under the Texas Antiquities Act anything 50 years or older becomes a history of the park,” said Moore. 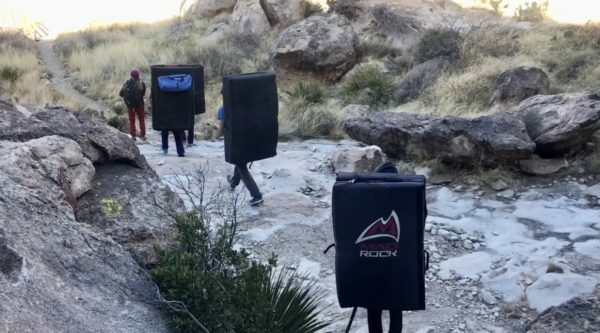 According to Moore, Hueco Tanks over time has also been a popular rest stop for travelers because it offered a vast water supply from the many holes in the rocks that retain water. The place is also unique because it has many plants and animals not found in a typical desert area. “We are in the desert, but in a way, we are not,” Moore. Rock climbers walking to their first destination. In addition to its history and unique rock formations that attract visitors, Hueco Tanks is also a popular rock climbing site that attracts people from all over the world. “I take out hiking walking and bouldering tours every year. This is my 9th season in Hueco Tanks and the 6th season as a guide,” Ann Raber said, a volunteer guide and a rock climber. Hueco Tanks’ best season to visit is November to April when it offers cool weather that allows climbers to better grip the rock formations. Moore said hot weather makes it harder to grip the rocks during climbing and can cause quick dehydration. “It can be brutal in the summer. Over 110 degrees,” Moore said. Although Hueco Tanks is open to the public, visitors are not allowed to roam freely but supervised by guides to better conserve the park. An informational video explains its history and how best to preserve the park. “Don’t step in the Huecos because there is an aquatic eco system. Don’t touch the pictographs,” Moore often says to people who come to visit. Hueco Tanks is open daily. October to April from 8 a.m. to 6 p.m. From May to September, it is open Friday to Sunday from 7 a.m. to 7 p.m., and Monday to Thursday from 8 a.m. to 6 p.m.. Adults pay $7 and children 12 and under are free. To make a reservation call (915) 857-1135. The park’s address is 6900 Hueco Tanks Road No. 1 El Paso, TX 79938.